After weeks of speculation, it’s official: The traditional season-ending showdown, the Pacific Paddle Games, has been cancelled. The official status is “postponed til 2020,” not cancelled, but it’s definitely not happening this year and the future is fairly uncertain following the sale of event organiser SUP the Mag to a new parent company two months ago. 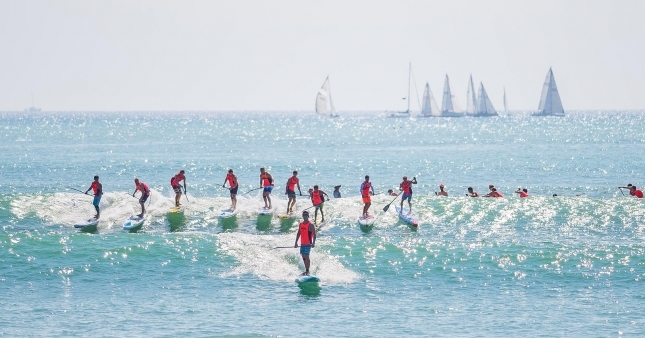 In case you haven’t been following the timeline: The Pacific Paddle Games (PPGs), which took over from the original Battle of the Paddle (BOP) back in 2015, was organised by SUP the Mag and its parent company The Enthusiast Network (TEN). But eight weeks ago American Media Inc. purchased 14x magazine titles from TEN, including SUP the Mag and the iconic Surfer Magazine. Being sold from one “corporate America” parent company to another usually means one thing: cost-cutting. And it seems the PPGs, which has always been a break-even-at-best event, was the first thing on the butcher’s table. In fact, it seems much of TEN’s business was deemed too expensive: the company apparently fired 50% of its staff on the eve of the sale to American Media in late January. Rumours of the PPGs’ demise started swirling through the SUP community shortly after that. But while it’s a blow to the sport, it’s hardly a surprise. As I highlighted just a few days ago, the Pacific Paddle Games had already been dethroned; see: The ‘Top 15’ Races of 2018. For the first time ever, the Gorge Paddle Challenge attracted the strongest international field followed by the Carolina Cup; the PPGs barely held on for third. This obviously wasn’t related to the event’s cancellation, but in hindsight it was pretty symbolic. Of course, elite participation is only one metric of a good event — and a poor one at that: “mass participation” and the quality of an event in general are just as important (if not more). But while the PPGs put on a great show (slick setup, professional webcast), amateur participation was also on the decline. The BOP open race peaked at 450 amateur competitors in 2012/2013; the 2018 PPGs had about 150. But perhaps the most telling metric was just how few brands were buying tent space on the beach in recent years. The 2013 BOP had over 90 vendors paying to showcase their gear; last year there were about 15. That probably said more about the health of the industry in Southern California than the event itself, but either way it was an ominous sign. In fact, last year looked like a bit of a ghost town in general. The fans just weren’t there to watch. Perhaps it’s because of the webcast, which the PPGs did a great job producing, but even then it’s hard to grasp just how much the crowds had thinned. Considering how hard the crew from SUP the Mag worked to produce the PPGs – and as someone who commentated every edition, I can vouch for just how much sweat went into this event – it’s a curious study of the wider sport to see why it ultimately failed. We should all be grateful to SUP the Mag for filling the BOP hole and giving us a major event every season, but thanks aside, what the hell happened? Why was there such a decline? Some say the PPGs charged too much for the amateur “open race” in 2015, driving away the weekend warriors – the ones who provide the grassroots foundation of our sport and many of its events – in the process. Others will tell you the PPGs was *too* good. It was too slick, too corporate — it lost the “festival” atmosphere and laidback vibe of the BOP. It was no longer a party on the beach, it was suddenly a serious sporting event (though ironically, many paddlers complained the BOP wasn’t serious enough). Neither of those criticisms are entirely fair: The industry in Southern California simply isn’t the same these days. Budgets are tight. I feel like the Battle of the Paddle went out on top — it did the perfect mic drop. If it had stuck around, the BOP probably would have seen a steady decline as well. While events in Europe, Brazil and Asia are still growing strong, California has been on a plateau for years now. Those two key criticisms also mask the many positives of the Pacific Paddle Games: The great platform it provided the elite athletes (and great entertainment it provided the fans), the great opportunity it provided the juniors, the great prize purse, the great coverage. Not to mention the very the fact it kept the traditional “Super Bowl” weekend alive for almost half a decade after the BOP suddenly bailed. So while the PPGs did alienate some of the amateur paddlers, I believe there’s a much simpler explanation for the decline in numbers. People inevitably get tired of doing the same thing in the same place every single year, and the sport has been making its annual pilgrimage to Dana Point for 11 straight seasons: 2008-2018. The elite athletes were already grumbling about the PPGs for the past couple of years — not because there was anything wrong with the event but simply because they were tired of doing the same old thing every September or October. Meanwhile, the weekend warriors were growing more interested in bucket list challenges such as Chattajack or races held in places they actually wanted to visit, such as the Gorge Paddle Challenge in Hood River. I hate to say it, but Dana Point has never really been on anyone’s travel bucket list. Even before I heard this week’s news, I was actually looking forward to being somewhere else in the first week of October this year. That’s not because I don’t love the BOP/PPGs (plenty of good memories) but simply because I was looking forward to being somewhere else just for a change. I think there was little the Pacific Paddle Games could have done to arrest its decline. But even with its decline, the nail in the coffin was definitely the sale of SUP the Mag to American Media Inc. Despite a damaging drop in numbers (and apparent loss of title sponsor Salt Life), the event could have survived in its old home at The Enthusiast Network. That’s because last year the PPGs received a cash injection from the wealthy, Tokyo-based owner of the APP elite series in what was apparently a three-year deal. However that was only a small slice of the overall event budget and clearly wasn’t enough to keep things afloat (and it probably wouldn’t have helped much anyway: while the APP always attracts a few dozen elite athletes, it doesn’t have a good track record of welcoming amateur competitors, which was precisely the PPGs’ problem). So back to the basic question: Is this the end of an era? I don’t think so. I think the golden era already ended back in 2014 after the final Battle of the Paddle. The posthumous PPGs era was simply a bonus. So thank you SUP the Mag for keeping the SoCal party going over the past four years. Hopefully it’ll return in some form in the future, and if not, the decade-long BOP-PPGs has certainly left one hell of a legacy.